Flunixin meglumine (Banamine) is a nonsteroidal anti-inflammatory medication that is used for the relief of pain, inflammation and fever in horses. Banamine is often the drug of choice for colicky horses, so most barn and horse owners have banamine on hand to administer if needed. Banamine is available in an injectable medication or an oral form. Veterinarians routinely use the injectable formula intravenously (IV). Horse owners may have oral and injectable Banamine on hand to relieve pain often associated with abdominal pain. It is important for owners to be aware of the risks if they give intramuscular (IM) injections of Banamine or other medications. Banamine can cause muscle damage when injected into muscle. In most horses this does not cause an issue. Although in some horses the spores of the bacteria Clostridium can lie dormant in healthy muscle and begin to proliferate if muscle is damaged. The growth of this bacteria causes Clostridial myositis, a serious and sometimes fatal condition. This starts as a sensitive, warm swelling under the skin and within 6 to 72 hours of the bacterial infection beginning, the swelling worsens and a crunchy area of gas forms under the skin at the site of the IM injection. Bacterial toxins are released into the bloodstream horses quickly become very ill or toxic with signs of depression, colic, purple gums, and reluctance to move. Diagnosis of Clostridial myositis is made by identifying gas produced by Clostridia in the damaged muscle using ultrasound and by examining aspirates of the area for bacteria. It is very important to have these horses seen immediately by a veterinarian. Treatment of Clostridial myositis early and aggressively can help decrease fatalities. Antibiotics such as penicillin and oral metronidazole are used in addition to surgically opening and cleaning any affected areas. 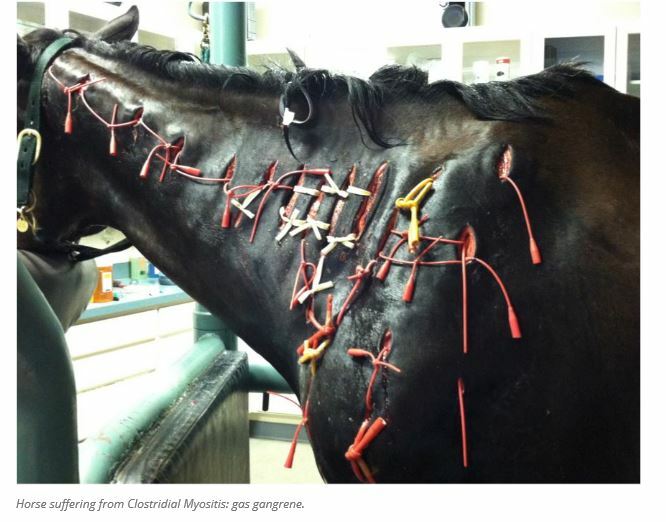 Between 31% and 73% of horses survive Clostridial myositis but it may take months for the skin and muscle to heal. Although the risks of Clostridial myositis are relatively low, it can occur. Whenever possible it is best to administer Banamine orally or have a veterinarian administer the drug IV. If any IM injection is given, the area should be monitored for signs of swelling and gas pockets under the skin and horse watched for fever or depression. Call your veterinarian immediately if you notice these signs.